Every time I hear of a tragic, premature and unjust death, the Tupac Shakur song “Life Goes On” begins playing in my head. It’s what I listened to when Columbine happened, and when the war in Iraq started. It’s what I’ll be listening to tonight thinking about the death of the ten-year-old Palestinian boy pictured above, who was shot in the head and killed by Israeli forces on Tuesday in the village of Ni’lin. Lots of innocents die everyday in the Middle East and around the world, but this death holds special significance for me because the child was known to my friend and colleague Willow Heske (she posted this picture on her blog), who is working in Palestine for the summer. 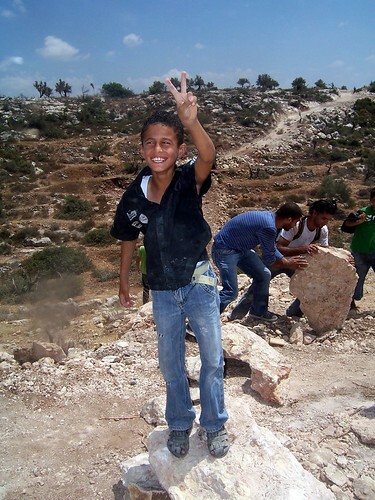 It also resonates because this child was shot during demonstrations against the “security wall” (more appropriately called the “apartheid wall”) being built through his village. The wall is a violation of human rights and international law, an attempt to ghettoize a people based on ethnicity and a harbinger of bad times. We should all be concerned about it, especially we Americans, because our tax dollars are indirectly financing it. I don’t like hyperbole for these kind of matters — the tragedy speaks for itself. I just want to bring attention to this boy’s unnecessary death.